Not to be confused with Republic of Ireland national football team. This article is about the men's team. For the women's team, see Northern Ireland women's national football team. The Northern Ireland national football team represents Northern Ireland in international association football. From 1882 to 1920, all of Ireland was represented by a single side, the Ireland national football team, organised by the Irish Football Association (IFA). In 1921, the jurisdiction of the IFA was reduced to Northern Ireland following the secession of clubs in the soon-to-be Irish Free State, although its team remained the national team for all of Ireland until 1950, and used the name Ireland until the 1970s. [n 1] The Football Association of Ireland (FAI) organises the separate Republic of Ireland national football team. On 18 February 1882, 15 months after the founding of the Irish FA, Ireland made their international debut against England, losing 13–0 in a friendly played at Bloomfield in Belfast. This remains the record defeat for the team, and also England's largest winning margin. On 25 February 1882, Ireland played their second international, against Wales at the Racecourse Ground, Wrexham, and an equaliser from Johnston became Ireland’s first ever goal. In 1884, Ireland competed in the inaugural British Home Championship and lost all three games. Ireland did not win their first game until 19 February 1887, a 4–1 win over Wales in Belfast. Between their debut and this game, they had a run of 14 defeats and 1 draw, the longest run without a win in the 1800s. Despite the end of this run, heavy defeats continued. On 3 March 1888, they lost 11–0 to Wales and three weeks later, on 24 March, lost 10–2 to Scotland. Further heavy defeats came on 15 March 1890 when they lost 9–1 to England, on 18 February 1899 when they lost 13–2 to England and on 2 February 1901 when they lost 11–0 to Scotland. In 1899, the Irish FA also changed its rules governing the selection of non-resident players. Before then the Ireland team selected its players exclusively from the Irish League, in particular the three Belfast-based clubs Linfield, Cliftonville and Distillery. On 4 March 1899, for the match against Wales, McAteer included four Irish players based in England. The change in policy produced dividends as Ireland won 1–0. Three weeks later, on 25 March, one of these four players, Archie Goodall, aged 34 years and 279 days, became the oldest player to score in international football during the 19th century when he scored Ireland’s goal in a 9–1 defeat to Scotland. In 1920, Ireland was partitioned into Northern Ireland and Southern Ireland. In 1922, Southern Ireland gained independence as the Irish Free State, later to become a republic under the name of Ireland. Amid these political upheavals, a rival football association, the Football Association of Ireland, emerged in Dublin in 1921 and organised a separate league and international team. In 1923, at a time when the home nations had withdrawn from FIFA, the FAI was recognised by FIFA as the governing body of the Irish Free State on the condition that it changed its name to the Football Association of the Irish Free State. The Irish FA continued to organise its national team on an all-Ireland basis. Between 1928 and 1946, the IFA were not affiliated to FIFA and the two Ireland teams co-existed, never competing in the same competition. On 8 March 1950, however, in a 0–0 draw with Wales at the Racecourse Ground in a FIFA World Cup qualifier, the IFA fielded a team that included four players who were born in the Irish Free State. All four players had previously played for the FAI in their qualifiers and as a result had played for two different associations in the same FIFA World Cup tournament. Northern Ireland's best World Cup performance was in their first appearance in the finals, the 1958 World Cup, where they reached the quarter-finals after beating Czechoslovakia 2–1 in the play-off. They were knocked out by France, losing 4–0. In the 1958 competition, Northern Ireland became the least populous country to have qualified for the World Cup, a record that stood until Trinidad and Tobago qualified for the 2006 World Cup. Northern Ireland remains, however, the least populous country to have qualified for more than one World Cup finals tournament, to win a World Cup finals match, and to have progressed from the first round of the World Cup finals. Despite the presence of world class forward George Best, another Manchester United player, for the 1960s and 1970s, Northern Ireland failed to qualify for any major tournaments. Northern Ireland also qualified for the 1982 World Cup. Their opening game was against Yugoslavia at La Romareda stadium in Zaragoza. It was the international debut of 17-year-old Norman Whiteside, who became the youngest player ever in the World Cup finals, a record that still stands. The game finished goalless. Five days later, they drew 1–1 with Honduras, which was a disappointment, and many believed had doomed Northern Ireland's chances of advancing in the competition. They needed a win against hosts Spain in the third and final group game at the Mestalla Stadium in Valencia. They faced a partisan atmosphere with a mostly Spanish crowd and a Spanish-speaking referee in Héctor Ortiz who was unwilling to punish dirty play from the Spanish players. A mistake from Spain goalkeeper Luis Arconada, however, gifted Gerry Armstrong the only goal of the game, and despite having Mal Donaghy sent off on 60 minutes, Northern Ireland went on to record an historic 1–0 win and top the first stage group. In the 1986 World Cup, they reached the first round. Billy Bingham, a member of the 1958 squad, was manager for both of these tournaments. They have not qualified for any other World Cups since. Lawrie Sanchez was appointed in January 2004 after a run of ten games without a goal under the previous manager Sammy McIlroy, which was a European record for any international team until San Marino went over 20 games without scoring between October 2008 and August 2012. That run ended after his first game in charge, a 1–4 loss to Norway in a friendly in February 2004. The run of 16 games without a win ended after his second game, a 1–0 victory in a friendly over Estonia, with a largely experimental side, in March 2004. On 7 September 2005, Northern Ireland beat England 1–0 in a 2006 World Cup qualifier at Windsor Park. David Healy scored the winner in the 73rd minute. 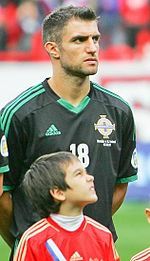 Almost a year later, on 6 September 2006, Northern Ireland defeated Spain 3–2 in a qualifier for UEFA Euro 2008, with Healy scoring a hat-trick. In June 2007, Nigel Worthington was named manager in the place of Lawrie Sanchez, who took over at Fulham. 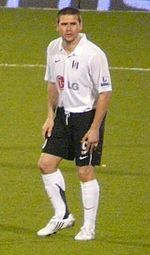 Initially, Worthington took over until the end of the Euro 2008 qualifiers, but was later given a contract until the end of the Euro 2012 qualifiers. Michael O'Neill became manager in February 2012 after Worthington had resigned in October 2011 after a poor Euro 2012 qualification campaign. The Northern Ireland team qualified for its first ever UEFA European Championship, Euro 2016 in France, after beating Greece 3–1 at Windsor Park on 8 October 2015. At the tournament, Northern Ireland were beaten 1-0 by Poland on 20 June 2016 followed by a 2–0 win against Ukraine on 16 June 2016 and finally a 1-0 loss against Germany in the group stage. That was enough to qualify for a Round of 16 spot where they lost 1-0 to Wales due to an unfortunate own goal by Gareth McAuley. Northern Ireland play their home matches at Windsor Park, Belfast, home of Linfield, which they have use of on a 108-year lease, giving the owners 15% of revenue, including gate receipts and TV rights. In March 2009, proposals were announced for the construction of a new 25,000 seat stadium in the Sydenham area of East Belfast as an alternative to the Maze proposal. This would form part of a major development, with links to both George Best Belfast City Airport and the Bangor railway line. The development would also include a hotel, and retail/leisure areas. The stadium itself would be used for both football and rugby union, with Glentoran and Ulster Rugby intended as tenants. Ulster GAA, however, who were a partner in the Maze proposal, stated that in the event of a new stadium being built in East Belfast, which is a major [unionist] area, their preference would then be to remain at Casement Park in [nationalist] [west] Belfast. The IFA were initially non-committal about any of the proposals for improving their facilities, be it rebuilding Windsor Park, or supporting either the Maze or Sydenham proposals. In September 2009, however, they issued an announcement in favour of the redevelopment of Windsor Park. Although there were no specifics to this, Linfield had previously released a study with two proposals, of which the major one would be a £20 million rebuilding of the stadium, raising the spectator capacity to 20,000. In 2011, the Northern Ireland Executive allocated £138 million for a major programme of stadium redevelopment throughout Northern Ireland, with £28 million allocated to the redevelopment of Windsor Park. In June 2012, further details of the stadium's redevelopment were released. The plan was to redevelop Windsor Park into an 18,000 all-seater stadium with a series of phased works originally intended to begin in the summer of 2013. The redevelopment would include the demolition of the existing East and South Stand structures, to be replaced by new purpose built stands that would partially enclose the stadium; complete renovation of the existing North and West Stands; and construction of both new conferencing facilities and a new headquarters facility for the IFA. In February 2013, planning permission for the redevelopment was granted. The cost of the project was estimated to be around £29.2 million, of which £25.2 million would come from government funding. It was initially planned for the work to begin in September 2013. Two months later however, Irish Premiership club Crusaders began legal proceedings to have the process judicially reviewed. As owners of the site, rivals Linfield were in line to receive not only a redeveloped stadium, but also £200,000 per annum from the IFA in land rent instead of the existing agreement which entitled Linfield to 15% of match revenue. Crusaders believed this to be against European Union competition law as well as a form of state aid towards Linfield. In a hearing that took place on 22 May 2013, Crusaders' request was granted. It was ruled that it was a possibility for the redevelopment to be classed as state aid towards Linfield. The aspect of the challenge concerning competition law, however, was dismissed. An element of Northern Ireland's support has been regarded as sectarian. Neil Lennon, a Roman Catholic Celtic player who had been subject to sectarian abuse from Northern Ireland fans while playing for Northern Ireland in Windsor Park, was issued with a death-threat by Loyalists and retired from international football in 2002 as a result. In 2006, Northern Ireland's supporters were awarded the Brussels International Supporters Award for their charity work, general good humour and behaviour and efforts to stamp out sectarianism. Representatives of the Amalgamation of Official Northern Ireland Supporters' Clubs received the award from UEFA and EU representatives prior to the Northern Ireland–Spain game at Windsor Park in September 2006. Steps by the IFA to promote Football For All continue. At a friendly match in Dublin in 2011 against Scotland, the IFA carried out an inquiry following an incident in which Northern Ireland fans sang sectarian songs. One fan who was identified in the inquiry was said to be in line for a lifetime ban from receiving tickets to any future Northern Ireland home or away games. Since the defeat of England in 2005, there has been an increased demand for tickets exceeding supply. Tongue-in-cheek songs such as "We're not Brazil, we're Northern Ireland" (sung to the tune of Battle Hymn of the Republic, an American Civil War song), "It's Just Like Watching Brazil" and "Stand up for the Ulstermen" are popular at home matches. Results updated as of 12 November 2017 after the match against Switzerland. ^ Includes matches against Yugoslavia and Serbia and Montenegro. On 23 February 2014, Northern Ireland were drawn to face the Faroe Islands, Finland, Greece, Hungary and Romania in UEFA Euro 2016 qualifying Group F. The matches were scheduled to be played between September 2014 and October 2015. On 25 July 2015, Northern Ireland were drawn to face Azerbaijan, Czech Republic, Germany, Norway and San Marino in 2018 FIFA World Cup qualification – UEFA Group C. The matches are scheduled to be played between September 2016 and October 2017. The following players were called up for Euro 2020 qualifying games against Estonia on 21 March and against Belarus on 24 March 2019.Caps and goals updated as of 21 March 2019, after the match against Estonia. Sky Sports currently have the rights to show Northern Ireland's all competitive international fixtures. Highlights of qualifiers are shown on ITV with rights to World Cup Finals and European Championships held jointly by BBC and ITV - both channels broadcast Northern Ireland's games at Euro 2016. Dating from the 1960s, for many years Northern Ireland's games were shown live on BBC Northern Ireland, with highlights on network BBC via Sportsnight until the rights to home games were sold to Sky in 2007. In May 2013, Sky acquired the rights to all Northern Ireland qualifying games for UEFA Euro 2016 and the 2018 FIFA World Cup. From 2008–2013, BBC Northern Ireland held the rights to highlights of all of Northern Ireland's home international qualifiers. But in May 2013, ITV secured a deal to show highlights of the European Qualifiers for Euro 2016 and the 2018 World Cup, including Northern Ireland games, between 2014 and 2017. In 2015, BBC Northern Ireland acquired the live rights to show Northern Ireland's friendlies in the run-up to UEFA Euro 2016, but the next two subsequent home friendlies against Croatia and New Zealand were on Premier Sports/eirSport until the contract ends before the 2018 World Cup. ^ The last match played as Ireland was 1978 versus Scotland, however, apart from this match, all British Championship matches had been played as "Northern Ireland" since the 1973–74 tournament. In the 1972–73 tournament, the first two matches were played as "Ireland" and the third as "Northern Ireland". In the 1971–72 tournament, the first was played as "Ireland" and the second and third as "Northern Ireland". 1970–71 was the last tournament in which all matches were played under the name "Ireland". ^ Matthew Taylor (2008). The Association Game: A History of British Football. Harlow:Pearson Education Ltd.
^ "NIFG: Northern Ireland Programmes 1975–1978". Retrieved 13 June 2016. ^ "NIFG: Northern Ireland Programmes 1972–1975". Retrieved 13 June 2016. ^ "NIFG: Northern Ireland Programmes 1968–1972". Retrieved 13 June 2016. ^ Whiteside, Norman (2007). Determined. Headline Publishing Group. p. 129. ISBN 978-0-7553-1598-7. ^ Whiteside, Norman (2007). Determined. Headline Publishing Group. p. 135. ISBN 978-0-7553-1598-7. ^ Jackson, Lyle (16 June 2016). "Ukraine 0, Northern Ireland 2". BBC Sport. Retrieved 16 June 2016. ^ "IFA wants out of Windsor contract". BBC News. 17 July 2007. Retrieved 20 May 2010. ^ "Lord's Hansard on the question of building an NI national stadium". ^ "Tide Turns Against The Maze". ^ "Stadiums fit for our heroes on way at last Belfast Telegraph". Belfast Telegraph. 11 March 2011. Retrieved 8 May 2013. ^ "WINDSOR PARK REDEVELOPMENT PROJECT". Irish Football Association. 25 June 2012. Retrieved 8 May 2013. ^ "GREEN LIGHT FOR STADIUM REDEVELOPMENT". Irish Football Association. 20 February 2013. Retrieved 8 May 2013. ^ "Windsor Park funding faces legal challenge from Crusaders". BBC Sport. 17 April 2013. Retrieved 8 May 2013. ^ "Crusaders win right to oppose government funding for Windsor". BBC Sport. 22 May 2013. Retrieved 23 May 2013. ^ "Crusaders support settlement on Windsor Park upgrade". BBC Sport. 16 July 2013. Retrieved 23 July 2013. ^ "Sports Minister Caral Ni Chuilin 'committed' to Windsor upgrade". BBC Sport. 26 September 2013. Retrieved 20 December 2013. ^ "WORK BEGINS AT WINDSOR PARK". Irish Football Association. 6 May 2014. Retrieved 16 May 2014. ^ Brian McNally (5 March 2010). "Why Northern Ireland continue to pay the price for abuse dished out to Neil Lennon". Daily Mirror. Retrieved 21 February 2011. ^ "Anger at sectarian songs after NI game". UTV News. UTV. Retrieved 18 October 2012. ^ Horne, John. "Racism, sectarianism and football in Scotlandaccessdate=18 October 2012" (PDF). ^ Tim Rich (23 August 2002). "Death threat forces Lennon to place family feelings first". London: The Independent. Retrieved 21 February 2011. ^ "BBC News Star helps in graffiti removal". 30 October 2003. Retrieved 6 January 2010. ^ "Lennon hails anti-sectarian drive". BBC News. 25 October 2006. Retrieved 6 January 2010. ^ "PRAISE FOR IFA'S FOOTBALL FOR ALL AWARDS NIGHT". ^ "Northern Ireland Fans Are Officially The Best In Europe". Irishfa.com. 24 August 2006. Retrieved 5 November 2012. ^ "Holding pen plan is dismissed by Northern Ireland supporters' group". Belfast Telegraph. 21 February 2011. Retrieved 21 February 2011. ^ "Ballymena's Denver Gage faces sectarian songs probe". BBC. 19 February 2011. Retrieved 21 February 2011. ^ "Irish FA to ban Northern Ireland fan after chants". BBC News. 18 February 2011. Retrieved 21 February 2011. ^ "Caral Ni Chuilin attends NI game at Windsor Park". BBC News. 11 August 2011. ^ "BBC news story on NI ticket sales". BBC News. 5 April 2006. Retrieved 6 January 2010. ^ "Football: George Best: Football's first icon". The Guardian. London. 27 November 2005. ^ "Historical Results – Fixtures And Results – International – The Irish Football Association". Irishfa.com. 16 July 2012. Retrieved 5 November 2012. ^ Jackson, Lyle (14 November 2009). "BBC:''Northern Ireland 0–1 Serbia''". BBC News. Retrieved 2 July 2010. ^ "Spain face Ukraine return in EURO 2016 qualifying". UEFA.com. Union of European Football Associations. Retrieved 22 February 2014. ^ "FIFA World Cup Preliminary Draw". FIFA.com. ^ "2018 FIFA World Cup Competition Format". UEFA.com. ^ "Northern Ireland: Michael O'Neill names 27-strong squad for opening Euro 2020 qualifiers". Irish Football Association. 12 March 2019. Retrieved 12 March 2019. ^ "Irish Football Association's Greatest Ever Football Team". ^ "Sky TV deal to net IFA over £10m". BBC Sport. BBC. 27 April 2007. Retrieved 5 October 2013. ^ Beacom, Steven (15 May 2013). "Northern Ireland fans can reach for the Sky again with new TV deal". Belfast Telegraph. INM. Retrieved 5 October 2013. Wikimedia Commons has media related to Northern Ireland national association football team.